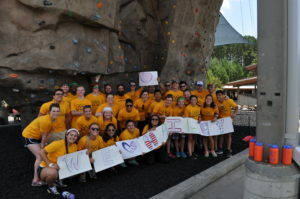 This adaptive program focuses on building survival skills through a variety of activities, including whitewater rafting, a ropes course with high and low elements, rock climbing, fire building, campsite cooking, and tent living. Through this adventure, campers learn to work together to accomplish a variety of goals within the program. We are excited to be able to partner with the National Ability Center for another opportunity to do adaptive programming. It is a rigorous and challenging program and is not recommended for campers who have decreased strength and/or endurance, or campers who have fluctuating blood counts. This includes individuals who are currently receiving chemotherapy. Rafting is not requirement for the program. We welcome campers that are interested in the challenge of the program, but do not wish to raft. Eligible campers who wish to raft, must complete and submit the Swim Test Instructions and Confirmation Form prior to the registration deadline, or they may not be eligible to raft during the program. Please be familiar with the Program Expectations and Goals.